Immediately following your accident, it is important to call us so we can notify you of the protocol to follow with your insurance company. Once you bring your car to our shop, we will give you an estimate as well as meet with the insurance adjustors. If an insurance adjustor tries to sway you into using one of their preferred shops, know that BY LAW you can take your vehicle to any repair facility of your choosing. They try to sway to cut corners. Visit our office at any time during business hours to get your FREE computerized estimate. Our estimators will gladly answer any questions about the repair process and insurance procedures. We honor all insurance company estimates, and will work out any additional items your car requires above the initial estimate with your insurance company. We can also help you get into a rental car of like-kind if you were not at fault for the accident. Tear down, Repair, Paint. Even the most difficult jobs are no problem for our certified technicians who have over 100 years combined experience in the auto body repair and mechanical industry. Our job is to work with your insurance company to make sure your vehicle is restored to pre-accident condition. In addition, we guarantee a paint color match and extend a lifetime paint and body warranty. Expect the quality you deserve. Once the repair has been completed, your car will be given a full FREE detail including an extensive vacuuming and wash. We want to make sure you leave our shop with the best. When you pick up your vehicle, we’ll also take care of any outstanding paperwork, let you inspect the repair, and release your car to you. Please let us know if you need any follow-up or have concerns by calling or visiting our office. We are happy to see you! You have the right to go to the repair shop of your choice regardless of your insurance companies recommendations. Differences in repair estimates are common. A lower estimate may not include all necessary work. If you’re not sure why one estimate is different from another you’ve received ask the shop manager. Things that can affect the repair timeline include weather, holidays, the delay of part delivery, and working with the insurance companies. 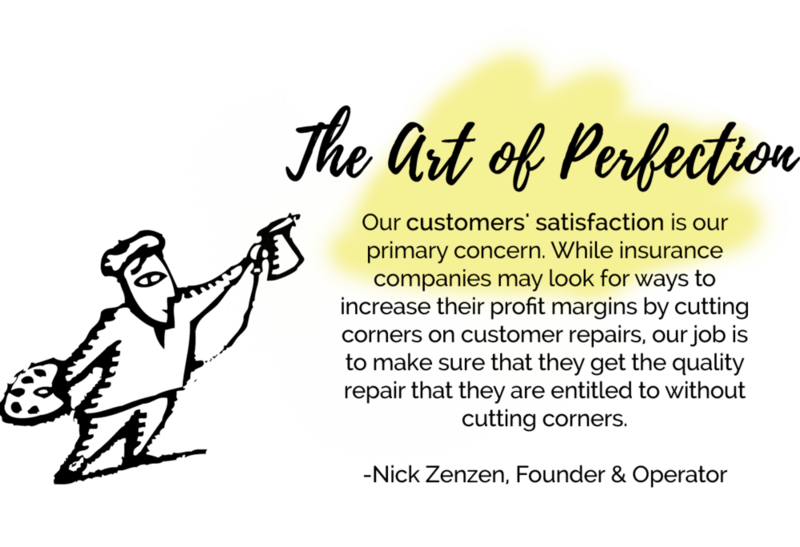 Typical repairs need supplements written to include repairs that your insurance companies missed in their original estimate. If we work off of our own estimate and don’t have to wait for insurance company approval, we are more likely to give you an accurate return date. Unfortunately, the timeline is sometimes out of our hands and has nothing to do with our process at the shop. What's our warranty or guarantee? We offer a lifetime body/paint guaranty, manufacturers part warranty, and color match. What's the difference between after-market and OEM Parts? After-market parts are parts that are manufactured by a company other than the car manufacturer, while OEM are brand-new factory manufactured parts. Unfortunately, some insurance companies “fine print” states that they are allowed to write up estimates that require the use of after-market parts. While we prefer using OEM parts, this is beyond our control. We do make sure that the after-market parts are “safe” and “undamaged,” and will not but a sub-par part on your vehicle. What if something goes wrong after my car is returned? Our techs do a very thorough job, but occasionally there are issues that arrive once the car has been driven again after the accident. Most of this is difficult to predict, but please contact us immediately if something does not seem to be right. Is your paint as durable as the manufacturers? Our paint is not as durable as the manufacturers, however we do stand behind our lifetime warranty on all of our paint work. Do you have drop-off service? We do have a dropbox where you can leave your keys if you need to drop the vehicle off before or after hours. I got hit by someone, what are my rental car options through my insurance company? If you have been hit and the accident is not your fault, you are entitled to vehicle of “like-kind.” I.e. If you have an SUV your insurance company is required to give you something similar. However, you must check your policy to see if you have rental coverage. What if the repair costs are more than my car is worth? You do have options. Talk to us about your situation. It will be your responsibility to pay Fort Collins Collision Repair the deductible when you pick up your vehicle. We accept VISA/MasterCard, Cash, Insurance Checks and Bank Checks. We DO NOT accept personal checks. No, it is up to you to decide how many estimates you would like and if you want to discuss the repairs with more than one shop. If you have decided to use us as your repair facility, we will deal with the insurance company directly throughout the rest of the repair. Yes, it is your responsibility, and your right, to choose who will repair your vehicle. Often times insurance companies will try to steer you towards certain shops, and it is not always in your benefit. Know that you have a LEGAL RIGHT to decide where you would like your car repaired.